A Marash embroidery made of velvet. 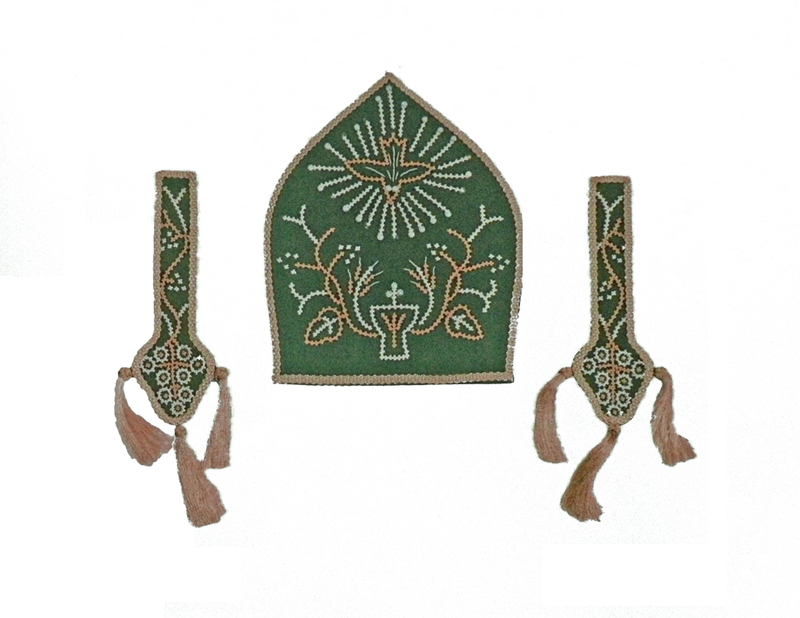 Various portions of religious clothing worn by the clergy during church rituals. Property of St. Kevork Church, Aleppo. 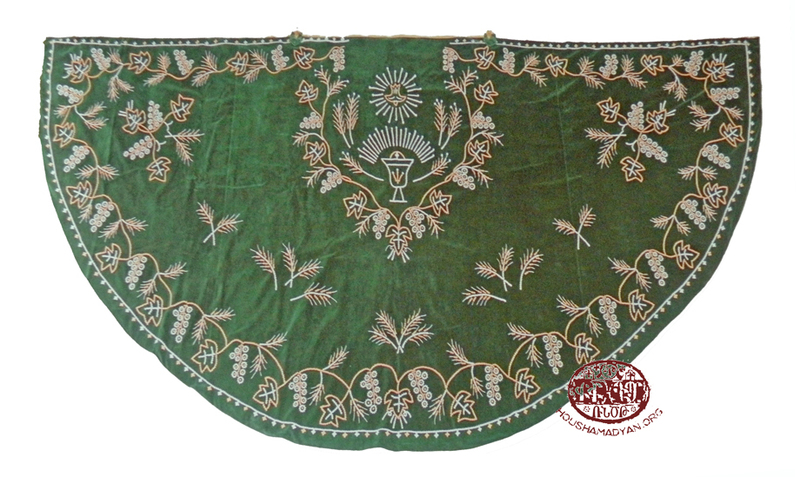 Sewn by the sisters Zvart and Nazeli Koutoudjian in the 1980s (Source: Hrazdan Tokmajian, Marash Needlework, published by Union of Marash Armenians – Kermanig Vasbouragan Cultural Union, Aleppo, 2010). One of the prominent monasteries of the Sev Mountains. It was a well developed and populated monastery. The church was probably in disrepair when the construction of a new church was launched at the beginning of the 12th century, followed by a festive consecration. The builders, however, never got the chance to enjoy the new edifice due to an earthquake that struck. This monastery was located near the Sev Mountains monasteries, and served as a bishopric. Madteos Urhayetsi writes that the monastery was “near Marash” and says it was destroyed by an earthquake. Krikor Kalustian, the Marash History author, writes that this monastery is to be found beyond the village of Döngele and Yenicekale, located to the west of Marash. 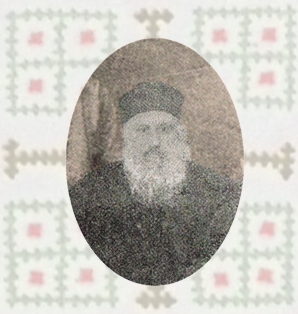 Krikor Bahlavuni and his brother, Nerses Shnorhali (Nerses the Gracious), were educated and raised in this monastery, having Catholicos Gregory II the Martyrophile (Krikor II Vgayaser) and Catholicos Basil of Ani (Parsegh I Anetsi) as teachers. The monastery produced a group of stellar students, graduates with the appellation “gracious”, who became prominent church figures. 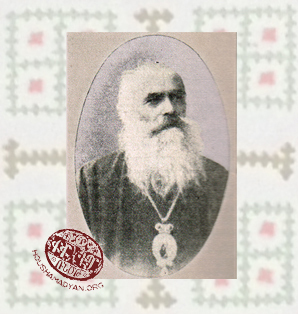 It is recorded that in 1849, Archimandrite Karnetsi Hovhannes took great measures to renovate the monastery, but unfavorable circumstances foiled his plans. According to another tale, when the ancient St. Hagop Monastery collapsed, the monks did not dare enter the town and took refuge in the huts outside, which later are turned into churches . It is said that for this reason all six Marash churches were built on the outlying sections of the town. Based on the tales regarding St. Hagop Monastery, we can conclude that a despot ruling over Marash demolished the monastery. Scores of hand written texts preserved in the Saint Kevork Church and silver church items, said to have been brought from the St. Hagop Monastery , attest to the one-time ornate and luxurious existence of the monastic edifice, as well as the fact that the people never forgot the location of St. Hagop, which remained a pilgrimage site. The holiday of Vartavar (Festival of Roses) was an occasion for all the people to make a pilgrimage to Taksarakol, when the throngs would head off to the promontory of Kırkgöz (Karasnag). Together, young and old, male and female, would start the climb after midnight. As the first rays of the morning sun shone down, an open-air liturgy would be performed. The pilgrims would offer animal sacrifices (madagh), followed by festive native song and dance. It is also said that when a tragedy or epidemic occurred in Marash, large crowds of the faithful would climb Taksarakol hill to pray and beseech God for an act of salvation. Armenian Marash is known for its six churches: St. Karasun Manug, St. Sarkis, St. Kevork, St. Stepanos, St. Garabed and St. Astvadzadzin. Churches are maintained by the annual yughakin, a sort of church tax paid by the people, as well as gifts made on various occasions. Each church has its ishkhan-aghas, who generously support the church with gifts. Each church also has its taghayin khorhurt (Neighborhood Council), whose members are elected from prominent public figures of the community. 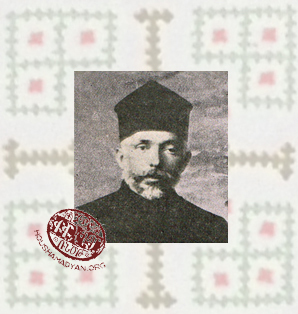 Much later, in the years following the 1908 Constitutional period, the churches started to establish parish councils (hokapartsakan marmin) to manage school and charitable activities. The clergy, especially parish priests, had great influence and enjoyed the unconditional respect and esteem. The Armenian churches of Marash were always the first targets when nationalist-religious pressures broke out. The Marash churches suffered heavily during the 1895 Hamidian massacres, when the Church was sacrificed to the sword and fire; parishioner and priest alike. After a brief few years of respite and recuperation, what followed were the massacres and eviction of the 1915 Genocide and the final tragic demise of Armenian Marash in 1920. Along with thousands of Marash Armenians, the churches - ancient testaments to their existence – also expired in the ashes. To complete our depiction of the Armenian churches of Marash, let us wind our way through the hilly streets of the old city, where we will rediscover Armenian Marash with its six churches. Marash was built on seven high hills and hillsides. These promontories are separated by ravines and valleys and the town’s 41 residential neighborhoods are connected by these byways. Armenian Marash, with its churches, encompasses more than one half of the outer districts, either completely Armenian populated or Armenian-Turkish mixed – Karamanlu, Adjemli, Alchu-köy, Shekerdere, Tekke, Hay Tagh, Kiumbet, Sheikh-mahallesei, Koyudjak, etc. Many saw this; it is no lie. From St. Stepanos we head north. The long road downhill takes us to the Akdere neighborhood and the spiritual environs of St. Garabed, practically on the northern outskirts of the town. The holiday of Vartavar was an annual day of festivities. Throngs of people would head to St. Stepanos as a place of pilgrimage, in a way replacing the old monasteries and pilgrimage sites. The parish priests preceding 1895 were: Rev. 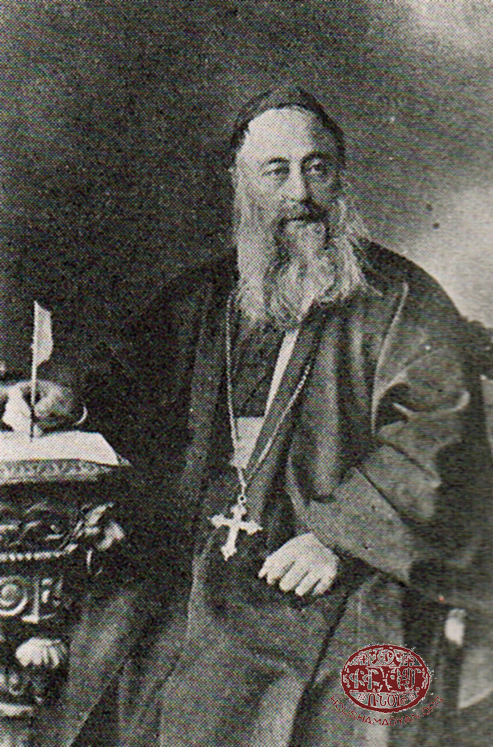 Harutyun Harutyunian, Rev. Mesrob Dishchekenian, Rev. 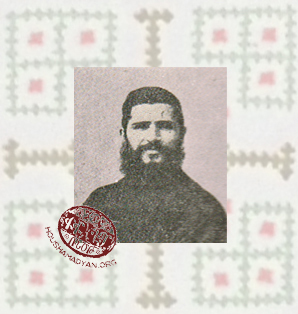 Kevork Charkhapanian, and the brothers Rev. Garabed and Rev. 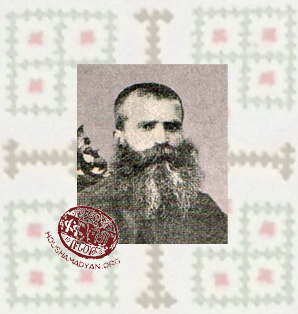 Zakar Saatdji Keyishoghluyan. 1907 – Ceremonial laying of the cornerstone for the reconstruction of St. Kevork Church (Shekerdere). In the center is Marash Primate, Archimandrite Goryun Yesayan (cassock and cowl). 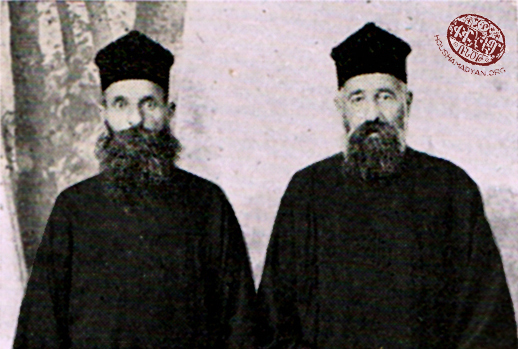 Immediately standing to his left is Senior Archimandrite Paren Melkonian (without cowl) (Source: Krikor Kalusdian, Marash or Kermanig and Heroic Zeytun, New York, 1934). 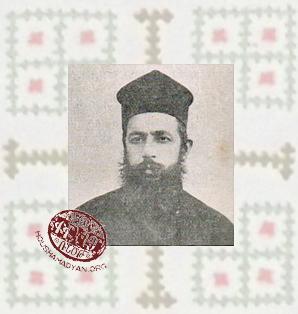 On the eve of WWI, the St. Kevork parish priest was Rev. 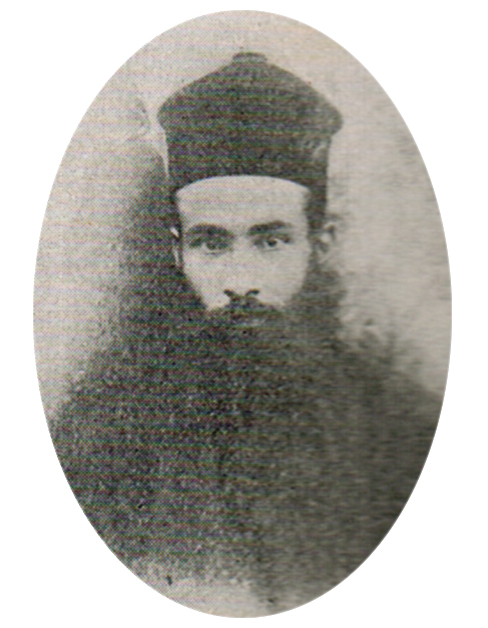 Harutyun Jamgochian. Of note is the fact that this church wasn’t very far from the historic St. Hagop Monastery in the same neighborhood. This leads us to assume that starting from the early Middle Ages this site was a fairly active and important religious and educational center. Let us now skip from these pages of rich historical record to more modern times. By the middle of the 19th century, Hay Tagh had lost its former brilliance, role and position, even while retaining its Armenian component – its population, unique churches, and name. The population of Hay Tagh, and consequently the majority of church members, came from poor families. There were no prominent merchants to take care of the church’s needs. Nevertheless, a small church school continued to operate. The name of Rev. 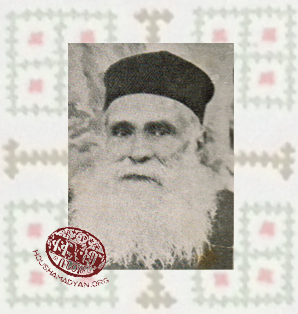 Garabed Aghayian (Agho irets) is recorded as one of the parish priests. During more recent periods, the clergy included: Rev. Garabed Garabedian, Rev. 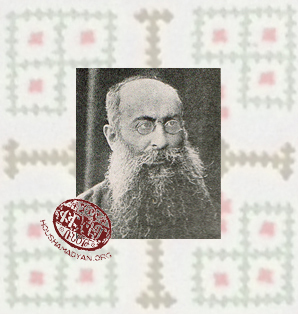 Hovhannes Der Hovhannesian and Rev. Arsen Der Hovhannesian. 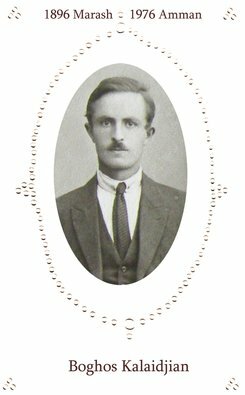 The last priest at St. Astvadzadzin was Rev. 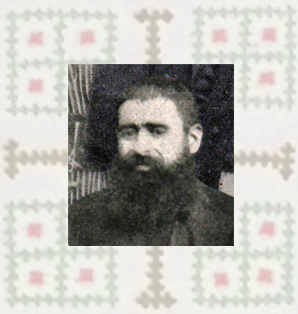 Hagop Dalkeledjian who, along with his parish, was martyred during the last massacre in Marash in 1920. 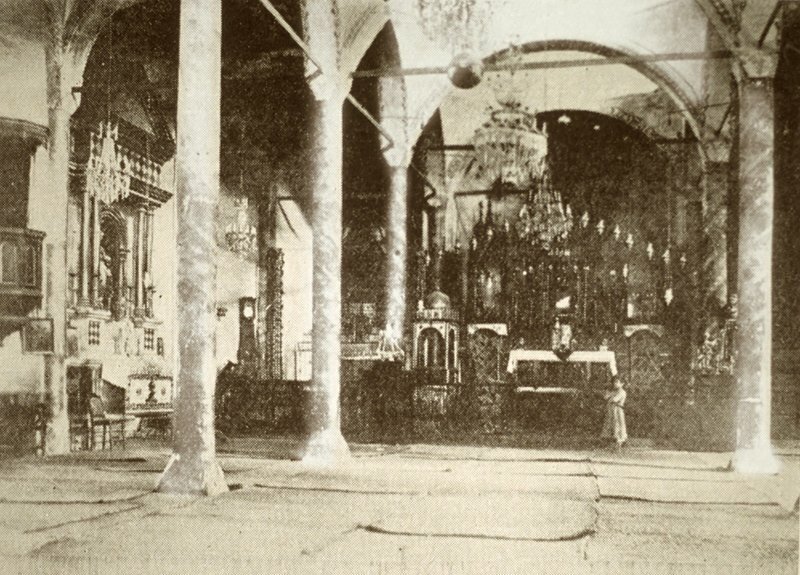 Interior of St. Pergich Church of Marash (Source: Krikor Kalusdian, Marash or Kermanig and Heroic Zeytun, New York, 1934). 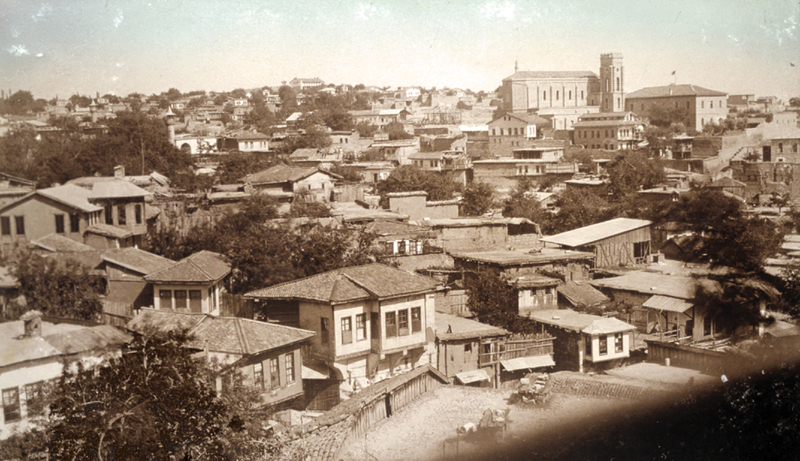 Construction began in 1860 in the Khatuniye neighborhood of the old city, on a parcel of land that was delineated and purchased by a sultan’s edict. The church was consecrated on December 29, 1865. On the outside, it had a right-angled design, with a length of 31 meters and a width of 16. According to church descriptions, all the walls were adorned with frescoes. There were three altars - Jesus the Saviour, the Holy Mother of God, and St. Gregory the Enlightener – each with a depiction of the saint. The oil painting of St. Gregory was especially valuable. Above the main portal of the church, there was an oil painting of the city’s first Armenian Catholic Primate, Bedros Apelian. Also located on church grounds were rooms for the celibate priests and a girl’s school, both built by His Eminence Apelian. 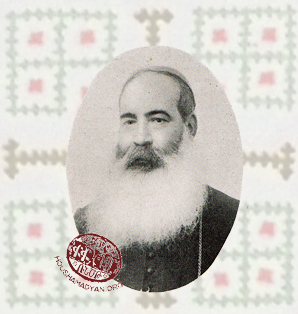 Archbishop Geghemes Mikayelian (1820-1890) (Source: Krikor Kalusdian, Marash or Kermanig and Heroic Zeytun, New York, 1934). 1) Funeral of Archbishop Geghemes Mikayelian. The deceased appears in the middle of the photo. Kneeling (left) is Harutyun Effendi Arekian. On the right is Kevork Agha Kherlakian (Source: Krikor Kalusdian, Marash or Kermanig and Heroic Zeytun, New York, 1934). 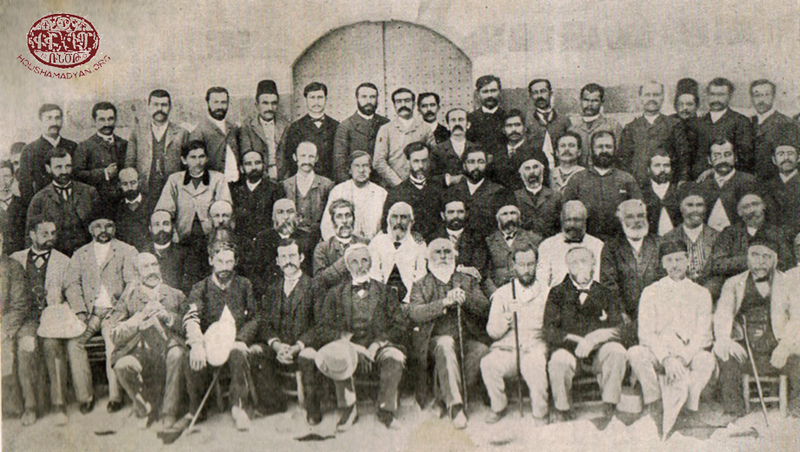 2) Armenian Catholic clergy of Marash – 1897. (Seated, from left): Rev. Mesrob Mesrobian, Archimandrite Hovsep Tatlian, Archimandrite Manvel Boyadjian, Mgr. 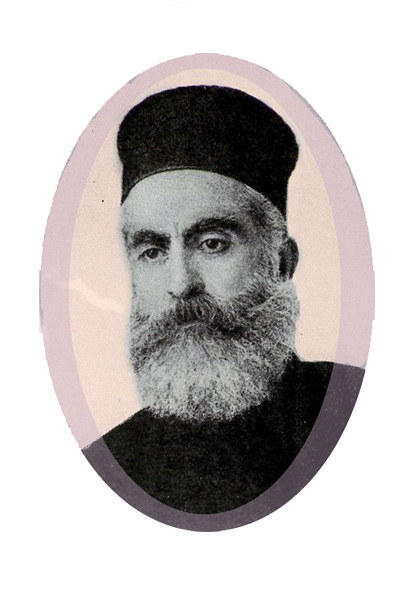 Avetis Tyurkian, Rev. Kapriel Kechedjian, Archimandrite Hovhannes Kemamdjian, Archimandrite Levon Kechedjian. (Standing, from left): Brother Garabed Ghzghenian, Archimandrite Kevork Gordikian, Archimandrite Vartan Baghchedjian, Archimandrite Mikayel Kechedjian, Archimandrite Andon Mavian (Source: Krikor Kalusdian, Marash or Kermanig and Heroic Zeytun, New York, 1934). 3) Armenian Catholic clergy of Marash and community members – 1915. (Seated, from left): Archimandrite Bedros Gostanian, Archimandrite Hovhannes Kemamdjian, Archbisop Avedis Arpiarian, Archimandrite Khoren Garabedian, Archimandrite Boghos Chalekian. 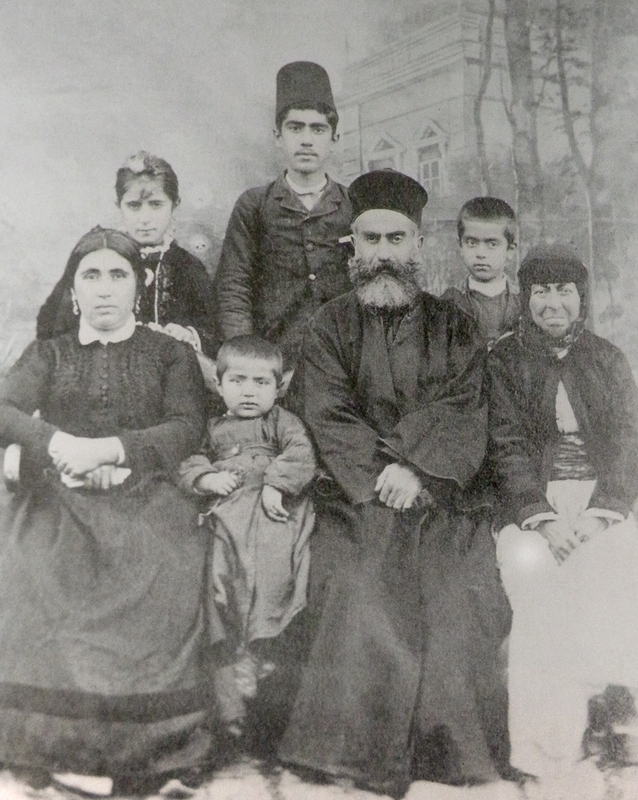 (Standing, center row, from left): Archimandrite Hovhannes Shadarevian, Archimandrite Manvel Yalentakian, Archimandrite Hovhannes Terzian, Archimandrite Geghemes Maldjian, Archimandrite Harutyun Maldjian. 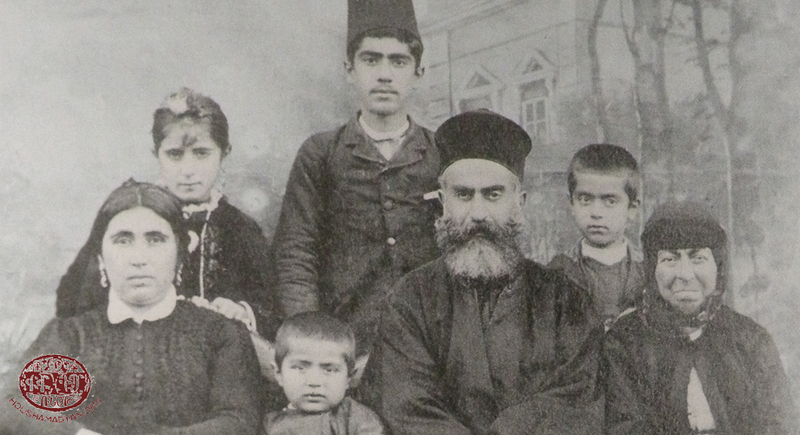 (Standing, top row, from left): Yesayi Mumdjian, Brother Levon Sarkisian, Brother Garabed Ghzendjian, Archimandrite Djaburian, Mgrdich Dosdoghrevian (Source: Krikor Kalusdian, Marash or Kermanig and Heroic Zeytun, New York, 1934). 4) Armenian Catholic Sisters of Marash. (Seated, from left): Lousia Dourayan, Mariam Nahabedian, Kohar Tatlian, Sdepania Chakmakdjian, Takuhie Maldjian. (Standing, from left): Mariam Kemanedjian, Ovsanna Fettalian, Josephine Partamian, Markrid Kiredjian, Pepe Apelian, Sbasuhie Yerezian (Source: Krikor Kalusdian, Marash or Kermanig and Heroic Zeytun, New York, 1934). Panorama of Marash. To the right, on a hill, is the Franciscan St. Anthony of Padua Church (Source: Michel Paboudjian collection). The Franciscan Fathers who served in Marash include: Materno Muré (35 years), Patrice Verkli, Alberto Amarissa, and Francesco di Vittorio. Marash Armenian Franciscan Fathers include: Stepano Yalenkatian, Berardo de Shadarevian, Leonardo Akelian, and Gregorio Devoghluyan. 1) Marash – St. Anthony of Padua Church of the Franciscan Friars (Source: Krikor Kalusdian, Marash or Kermanig and Heroic Zeytun, New York, 1934). 2) Members of the Franciscan Mission – 1914. (Seated, from left): Rezkallah Sakkal (teacher), Father Francis de Vi Horis, Habib Edde (French Consul General in Marash), Father Patrice Verkli, Father Materno Muré, Brother Olivier, Nazaret Danayan (teacher). (Standing, 2nd from left): Vartan Matosian (teacher) (Source: Krikor Kalusdian, Marash or Kermanig and Heroic Zeytun, New York, 1934). 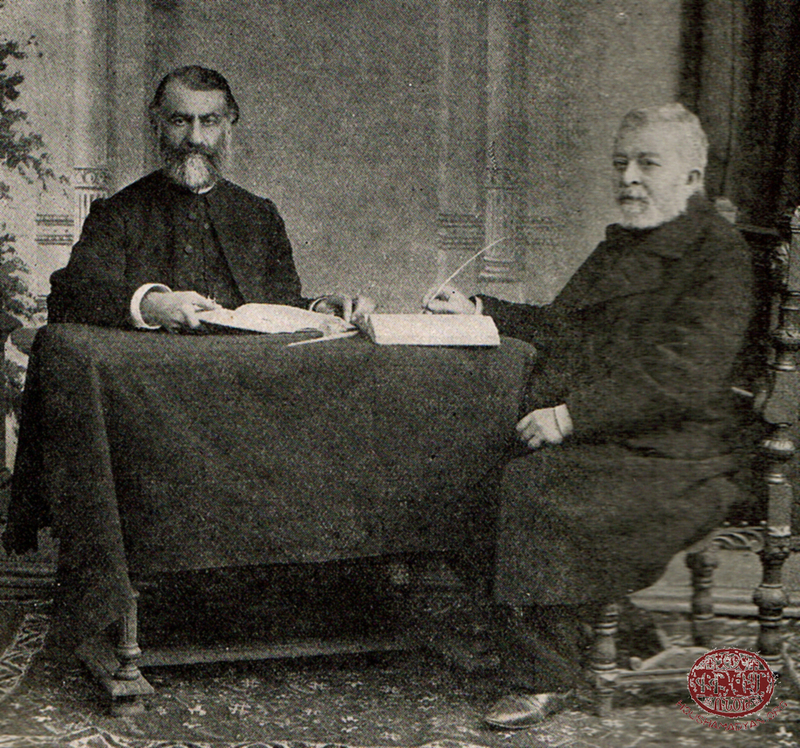 Pastor Avedis Gosdanian (left); Madatia Karakashian (right) (Source: Krikor Kalusdian, Marash or Kermanig and Heroic Zeytun, New York, 1934). 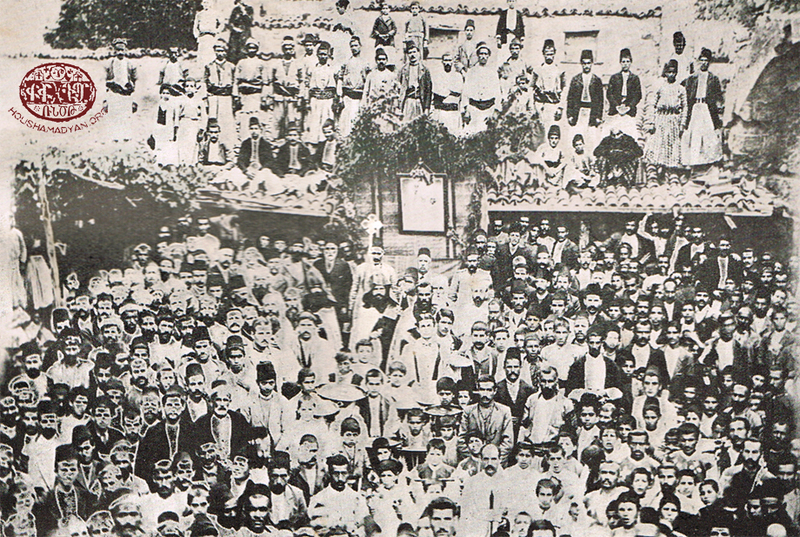 1890 – Participants at a general assembly of the Cilician Union of the Armenian Evangelical churches in Marash (Source: Krikor Kalusdian, Marash or Kermanig and Heroic Zeytun, New York, 1934). In his work dedicated to the history of Marash, Krikor Kalusdian notes an discrepancy regarding the names (p. 232), whereas the names constitute a unity, especially when we take into account the fact that the apostles Thaddeus and Bartholomew are generally recounted together, as the first proselytizers of the Bible in Armenia. Kalusdian, p. 232; Der-Vartanian, p. 48. The three paintings are now in Aleppo. 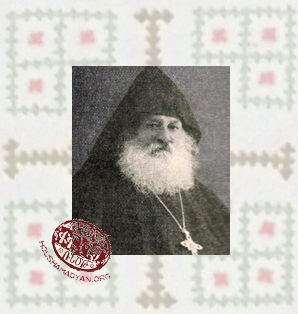 Do you have additional information, documents or photographs about the Armenian churches of Marash or the religious life of Marash Armenians in general? It is imperative that you give us your name, surname, and the source of your information.